The third season of Queer Eye is, unsurprisingly, a funny, warm, weepy delight. Much could be said about the wonderful things that happen therein, from the Jones sisters bottling their sauce (sniff) to the resilient spirit of a grieving single dad (sniff sniff), and on, and on, and on. But we’re here because of roughly 90 seconds of the Fab Five. In those 90 seconds, Antoni Porowski hands them each a tall, cool glass of heirloom tomato juice and lemonade. For those watching along at home, this is what the fellas drink at the end of season three, episode two, “Lost Boy,” in which the Fab Five help a camp director move past his Peter Pan syndrome and put down some roots. It’s a good episode featuring a weird-sounding beverage. We were obviously skeptical. Sure, a squeeze of lemon in a Bloody Mary works, but this combination didn’t make much sense to us. Clearly, we had to try it, and damned if it’s not pretty drinkable! Two members of the Takeout staff gave this a go. One of us used Campbell’s tomato juice and a standard drinks-cooler lemonade; the other used R.W. Knudsen Family organic tomato juice and a sparkling lemonade from Trader Joe’s. We both used about a 2:1 tomato juice-to-lemonade ratio, though the Knudsen concoction got some tweaks along the way, just to see if it could achieve the almost-pink color glimpsed in “Lost Boy.” (No dice.) The results were about the same for both. Adding lemonade draws out the sweetness of what Porowski calls the “fruit of the summer.” It somehow makes the tomato taste more summery. The lemonade also seems to dull the zippiness of the tomato juice, making it less acidic. So overall, it becomes sweeter and lighter, with or without the carbonation—and honestly, the bubbles neither added nor detracted from the experience. All that said, based on the light color and general translucence of the drink as seen in the episode, we wonder if perhaps Porowski wasn’t using heirloom tomato water instead of tomato juice. 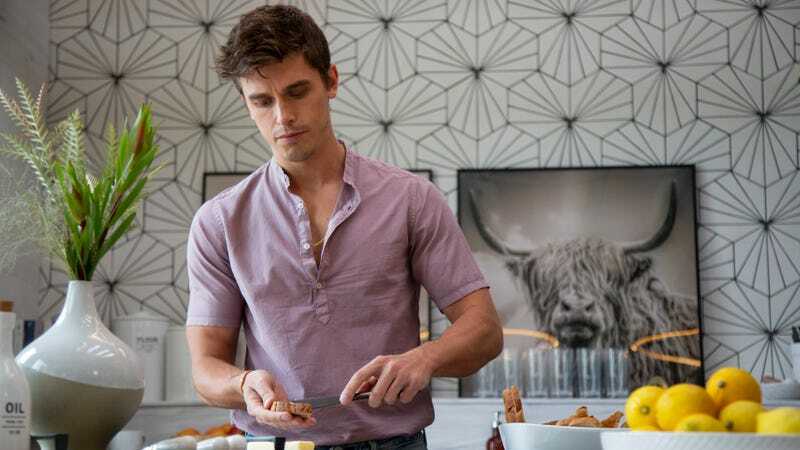 Maybe serve it at your restaurant, Antoni? If and when—and it’s probably when, as we’re a little fascinated by this elixir at the moment—we try it again, we’ll make some tomato water first and see if that doesn’t increase the lightness of the drink. The flavor is pure summer, but the the texture is still pretty heavy, and using tomato water would probably correct that. Thanks, Queer Eye guys, for the beverage adventure.